I arrived at Blackheath just after 08.30am and joined the swarms of runners walking up through a suburban high street, coffee shops packed with people in lycra enjoying a performance boosting hit of caffeine quite surreal. It was amazing, the park, the hot air balloons and the people, so many people swarming like ants all congregating on Greenwich Common. And then it hit me, I was here, I was part of it, I had to stop to take it all in (although it was more to do with the fact my stomach had just taken two somersaults inside my body and I wasn’t sure I could keep moving). I went straight into the start area (for runners only) and found one of the few remaining spots in the shade. Watching the big screen I spent time chatting to others, applying suncream and anti-chafing products (well I couldn’t have called it lubricant could I? ), and consuming the last of my energy products for the race. This year the start was phased to avoid congestion. I was at the slightly less busy blue start which used the grandstand for elite athletes. I had a friend who was in the start grandstand and said she’d look out for me – good luck with that with this many people… then I remembered that I was in pen 6 which would be starting between 10.22 and 10.28 if I used the patented “Andy Allway” © start technique (being at the back of the group in clear air avoiding congestion and jostling), I would have a reasonable chance of being spotted by Jacquie. I loitered at the back of the pen, when we were moved forward and at 10.22 when everyone ahead surged and broke into a run I walked the 500M to the start line. By the time we turned the final 90 deg corner before the start I was almost alone on the course, the other pen 5 & 6 runners were all jogging off into the distance. In true “Allway” © style I broke into a jog yards before the start and looked right for Jacquie. The grandstand were politely clapping these few stragglers through when I was spotted – ANNNNDEEEEEEEEEEEEEY!!!!!!!! I looked up and saw Jacquie and her sister leaping, screaming, waving. I started smiling, nerves now forgotten I turned I waved, did a little jig and blew kisses back, the rest of the crowd responded It was amazing these huge crowds were there for all these athletes but for this moment it felt like the entire start grandstand was supporting just me (and maybe a few others). The first few miles were bliss, the streets practically empty of runners at the back of my phase were full of crowds, families calling out your name, cheering you on and the reactions if you responded with a wave smile or thank you was like you were long lost family (three days on, on a 6am train into London thinking about it still gives me goosebumps and brings a smile to my face – I am getting some funny looks from my fellow commuters). This was fantastic, I’d already decided that due to the injury restricting my preparation and the weather my target would not be a time but to enjoy the experience and the day. I had calculated that I could run at a reasonable pace, allow for the weather and crowds and be under 5 hours (more on that later). The first (speedy runners), from the next phased start were catching me after about two miles but I didn’t care I was enjoying myself running along the quiet sided of the road high fiving the kids (and more adults than expected), smiling, waving and making the most of the day. One memory that will stay with me was at a 90 deg left corner at about mile three the road was really wide, there were crowds lining both sides of the road but due to the left turn all the runners were on the left more than 10 meters away. Approaching from the right I could see two toddlers with their family patiently waiting, arms outstretched hoping for a high five but as it was so far off “the racing line” nobody was anywhere near that side of the road. I stayed right, separated from the other runners and headed straight to that corner. The smile on their faces as I approached was incredible, a huge wide beam of excitement as I approached. It immediately reminded me of my son Matty, we couldn’t just high five so there on the side of some residential road in east London two toddlers I will never see again became members of the Hartfield secret handshake club. A combination of high fives, fist bumps and handshakes followed. I think I must have been stationary for some time but I don’t recall it as apart from meeting my own family it had to be the highlight of my run. I’m guessing quite a few members of the crowd must have seen this as for the next couple of hundred yards as I returned join the runners on the other side of the road I was getting a lot of cheers and comments. Just as well I wasn’t going for a time but I don’t think I will ever forget the smile on those toddlers faces. Going round the Cutty Sark was and experience and fun, so many people and me there in the middle of it, I couldn’t help but gee up the crowd a bit suggesting the crowds just back down the road cheered louder, unsurprisingly they responded with increased volume and intensity. All the interaction with the crowd meant that I really wasn’t aware of the distance I had travelled. The realisation that I had completed a sizeable portion of the race came when Tower Bridge came in to view. This is rightly one of the highlights of London Marathon, an iconic landmark pavements blocked with supporters, road full of little bobbing heads in the spring sunshine, I had to force myself to take it in as it passed all too quickly and I was now “north of the river”. 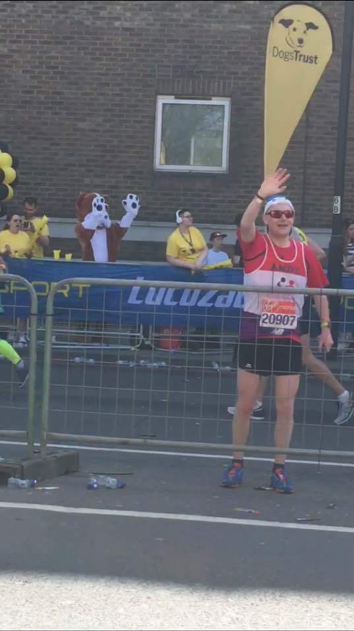 The National Autistic Society Cheer point was at Limehouse, we were going to pass it twice, at mile 14 when it was on the opposite side of the road and then at mile 22 on the way back from canary wharf. I was keeping an eye out for my family and the NAS flags but couldn’t see anything. HAAAAARTFIEEEELD!! Did I hear that right, oh wait a minute I recognise that shout, the very same Jacquie from the start line, on the other side of the road but behind me. I stopped turned around to look and there she was and better than that my family where with her. I had a decision, I had already passed them did I carry on and hope to find them on the way back or turn around do my best impression of a Salmon and fight against the stream to find them. The later of course, what a boost, seeing my wife and Matty that moment when he realised that funny looking fellow in the crowd over the road (see photo) was his Daddy. I took a few moments to wave and through the medium of mime indicate that all was wel, I was relaxed, calm and doing fine. Energised by seeing my family the next eight miles seemed to pass without incident. Coming back the other way past the cheer point I slowed to try and spot them but they weren’t at the cheer point, by this time I was walking. I had almost accepted that I had missed them when I spotted Amy, just ahead with Freya in her arms (Freya had been sleeping when I went by at 14 miles). What luck, it was great to stop, say hello, have a hug and a kiss. I could have stayed there for some time but not wanting to stiffen up I knew I had to get going again. Mile 22 only four more to go, wait a minute where was the dreaded wall? I had discomfort, painful hips, sore joints and what I later found out to be a huge, deep, blood blister and although my pace had slowed slightly the feared wall that I was expecting to be totally debilitating had not arrived (at this point I’d like to thank Fran for those hill reps and interval training sessions and to Caroline and Emma at Stonehenge Osteopath for re-building me and my (confidence)). I was slow, I was uncomfortable, but I was enjoying it and I was going to make it. It was only when I got to Waterloo bridge I realised that all my high jinks had resulted in my slowing a little more than anticipated. This is where stubborn Andy woke up, I had accepted that I was not going to go fast but 5hrs was a “comfortable” target and I had somewhat foolishly questioned colleagues as to whether I go fast and aim for 4hrs 30 or enjoy myself and run comfortably at just under 5hrs. To be over 5hrs would result in a lot of ribbing so feeling sore but OK I decided to kick on. The last mile or so was fast, in fact the fastest I ran throughout the race. I had set stubborn Andy a target and he had risen to the challenge, it wouldn’t be comfortable but Andy could do it. I spent most of the embankment and Birdcage Walk weaving between runners, looking for open areas to stretch my pace. I didn’t really take that much in on the mall I was focussed, I had the full “Paula Radcliffe” head roll, I even (somewhat embarrassingly in hindsight), swerved around people on the finish line who had slowed to a walk over the line. But looking at my watch (the official clock was on 5:31), I had done it 4hrs 59 minutes 19 seconds (the official time was 8 seconds faster). Unfortunately the exertion to get under 5hrs hit me about 10 minutes later. It took about 40 minutes to travel to the hotel from the finish line (it was a 10 minute walk but I had to stop, lie down and get some blood back to my head on several occasions). That being said after a massage, a shower and some hot food I was able to walk to the station with my family and bask in the glory of being a marathon runner. Would I do it again, definitely (just don’t tell the wife ………yet).